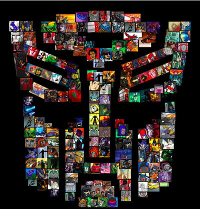 The Transformers: Mosaic project is a fan-based project to get artists and writers working together to create fancomics. Blackest Night is another of my one-page Transformer comics, and one of the most popular to date (currently it seems to be neck and neck with Voice In The Dark). It actually isn't anything to do with DC's Blackest Night, but it features all the black repaints up to no good, the pun was just too good to resist. See if you can name all the characters in it, of course if you're not a die-hard fan, not realising who anyone is shouldn't spoil it in any way. At least that is the idea. Some of the characters in this were black repainted keyrings from Japan, see if you can spot a keyring loop in one of the panels! Like with many of my other pieces, I wrote and coloured it, Jake Isenberg did the art, and Mark Kuggeleijn did the lettering. Click the image for the big version! That's a really awesome one, my favourite of your one-pagers so far. Ah, crap. I guess Guzzle? Sure. Guzzle. Too minor to bother replacing, too badass to die.